If you're searching for a unique way to express your eternal love, a champagne diamond eternity ring could be just what you need. These beautiful rings turn heads with their sleek and lovely style. Used for thousands of years to symbolize an unending love, eternity rings are a beautiful and classic jewelry choice. In a typical eternity ring, a simple band of stones goes all the way around the finger. However, some styles, especially those featuring larger stones, offer a sizing band in the back of the ring for comfort and practicality. Eternity rings make excellent wedding or engagement rings due to the natural symbolism that comes with an unending band of metal and gemstones. Husbands also have been known to give these rings to their wives after the birth of their first child or at other important events during their marriage. Champagne diamonds have experienced a recent surge in popularity, as the jewelry market has embraced colored gemstones of all kinds. 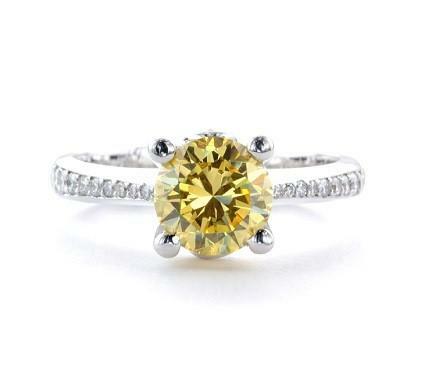 One of the rarest diamond colors, champagne diamonds lend a warmth and golden sparkle to diamond jewelry. Champagne diamonds are created when a diamond is formed under specific unusual conditions, and most natural champagne diamonds are mined in Australia. You may be able to find one or two examples of a champagne diamond eternity ring at your local jewelry store, but you'll find the best selection and value if you shop online. Online jewelry stores often carry more options when it comes to wedding and engagement rings, so they make it easier to find a ring that fits your personal style and budget. Make sure your champagne diamonds are genuine. Because this diamond color is so rare, you may see imitation or created champagne diamonds. After you receive the ring, have the diamonds certified by a local jeweler. When shopping online, be sure to check the return policy. If you don't like your ring when you see it in person, it's reassuring to know you can return it for a refund. Have your finger measured locally by several jewelers, especially if you're buying a full eternity band. Eternity rings can be difficult to re-size, so it's very important to make sure you have the correct ring size before you buy. If you can't find a ring you love, you could always buy champagne diamonds separately and have them placed in a ring setting. Most custom jewelers can help you create a unique ring with stones you choose yourself. Many jewelry experts believe that champagne diamonds look best in white metals. This is a matter of personal taste, but give some thought to the metal color of the ring setting. Research diamonds before shopping. Educate yourself on the four Cs: cut, clarity, color, and carat. The more you know, the more satisfied you'll be with your new ring.